I’ve mentioned how much more than I’m reading books but I am also now reading a LOAD of magazines. When we travel I always tend to buy a couple of magazines which isn’t cheap! With Readly (£7.99 per month) I have actually been saving money. I have noticed that I have a real love for celebrity gossip mags, especially now that I can access them all on the app! I’ve also read a lot of magazines that I just wouldn’t have read before and I have found some new favourites. Also you have access to the back issues too which I have been loving! You can use up to 5 devices so I can read them on my phone too, and you can create 5 users on each account so the whole family can use it! This is totally not sponsored but something that I have been absolutely loving – I am actually quite obsessed to be honest! This is my affiliate link where you can sign up and get your first month for free. You can cancel at anytime. I love this eyeshadow palette! It is on the more neutral side of life I guess, but it’s PACKED FULL of shimmery shades which I absolutely love. The colours are really pigmented, they do last all day but I have noticed a bit of fall out when I apply but that could just be because I’m rubbish with blending. Haha! For a palette that’s under £8 it’s a yes for me. I grabbed the travel size of this when I was getting travel minis from Superdrug and I absolutely love it. It will probably make you want to be on holiday and have pina colada’s – that’s never a bad thing! The scent has notes of coconut, pineapple and pretty orange blossom. I’d been given the face wipes of this Fine Flowers scent and even though there is rose it wasn’t too strong and I saw this on offer a while back and was tempted as my last one had ended. I love how easily this removed my makeup, especially mascara. Also the tub is huge! It’s 200ml and I’ve barely made a dent in it since I got it a few months ago, a little goes a long way. I had the Rodial sample of this and I honestly thought about making the splurge because I loved it so much. Then I saw this sister version from Nip + Fab and I know that Superdrug and Boots have regular offers on Nip + Fab products. It is actually I believe to be better than the Rodial version but I have been using this one more continually now. I had loved the Maybelline Tattoo Brow and when I went to repurchase they didn’t have the colour I use and I spotted the Revolution version. It’s only £5 so it’s cheaper and the brush takes a little while to get used to after the Tattoo Brow, it does tend to have a more width to it. The colour lasts about an extra day or so too. I’d been really unsuccessful finding a good lip oil, sadly this one isn’t scented raspberry it’s more that it adds a tint but it isn’t over glossy AND it’s not sticky either! Also for under £6 it’s a great addition and it’s now a permanent feature in my handbag. I have had this for a while and I’ve always loved it but I think now I’m using the Dragon’s Blood Serum and this… it really is a game changer. This is great on my t-zone, my target area for huge pores. There is also an anti-blemish formula to it and I think it’s really worked wonders for me on that too. So there is my March Favourites, what have you been loving? 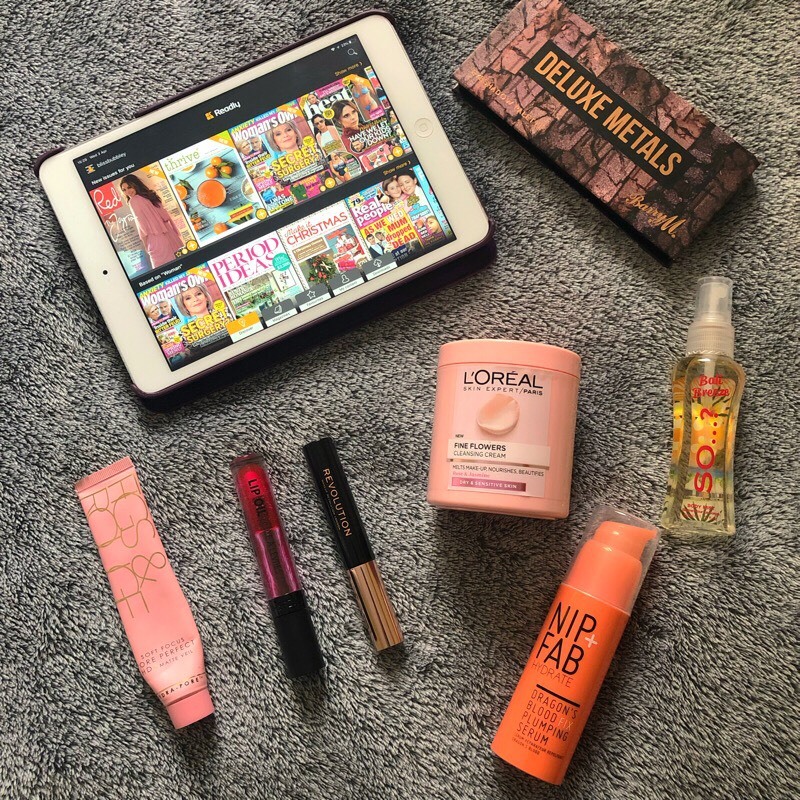 By Sarah | Filed under Randomness | Tags: Barry M, brows, eyeshadow, Favourites, Figs & Rouge, Fragrance, Gosh, L'Oreal, Magazines, March, March Favourites, monthly, Monthly Favourites, Nip + Fab, perfume, Readly, Revolution, Scents, So...?